what's new in Firebug 1.5? This is a re-post from Rob Cambell’s personal weblog. Firebug 1.5 is the first release that will work with the upcoming Firefox 3.6 and also also works with Firefox 3.5. It’s currently in beta and will be available before the release of Firefox 3.6. As of this minute, Firebug 1.5 is sitting comfortably in its third beta and available for download. This version is shaping up to be our best release yet and initial reports have been very positive regarding its stability, UI improvements and new features. So let’s take a look at some of the new features. In Firebug 1.4, we introduced the concept of “break-on-next” to the Script panel. This was a “pause” button sitting between the inspect icon and the Console tab. In 1.5, we’ve extended this concept to the Console, HTML and Net panels to allow more exciting types of breaks. In the Console, we’ve replaced the mini-menu Break-on-Errors option with the pause button. The reasons for this possibly contentious change was it made for a more consistent use of menus and the break button. Now, to enable Break on Errors, select the Console panel and hit the pause button. You’ll see that familiar glow to indicate that it’s waiting for an error. Now whenever an error occurs on the page, you’ll be dropped into the script panel at the line where the error occurred. Finally in the Net panel, the break button acts as a Break-on-XHR button. This is intended to help debug AJAX apps by allowing you to halt the debugger during an XmlHttpRequest send. As in the other break types, you’ll be transported to the script panel when an XHR object fires off its request and you’ll be given the option to copy the message. 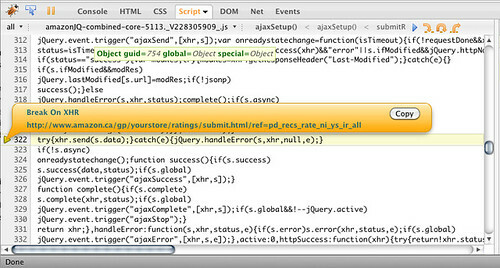 John Barton and Honza have written a great interactive demo page describing these new features on getfirebug.com. We made a few tweaks to the UI in this version. We replaced the “Off” label with a single “power” button (or window close button on Mac) as promised during the last release. Kevin Decker added the search panel originally intended for version 1.4 with some nice options. Persist option on Console and Net Panel. Save your data! Still more to come. Between now and final release we plan on hunting down a few more bugs to make this even more stable. Feel free to download and give it a try. just downloaded this beta version, so far so good! The search box makes everything so easy. Firebug really is a ‘must have’ add-on. I feel like an alien on a different planet, browsing this this web site. Is that because I’m not a developer? I used to be. I’ve been in the business 30 years. I find I do not know what Firebug is, other than something for developers. I see no way to download it. I see a suggestion that I may find demos interesting. What demos? Firebug is just an add-on to firefox. Very powerfull!